For courses in world cookery. 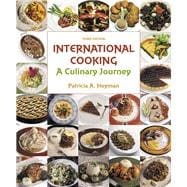 Explore the world of international cooking with Patricia Heyman’s Third Edition of International Cooking: A Culinary Journey. Streamlined yet comprehensive, this text will take you on a journey as you closely examine world cuisines with an emphasis on how they’ve developed and evolved over time. Each chapter brings the featured cuisine to life, beginning with a large, high-quality regional map and an exploration of the history, topography, cooking methods, common foods, flavorings, and general characteristics of each cuisine. Nearly 400 recipes, including breads and wine pairings where appropriate, represent a rich variety of foods and dishes from around the world. The text emphasizes flavor components that are unique to each cuisine, allowing readers to deepen their understanding of the relationships between regions and cuisines, while also learning about fusion and contemporary cooking. The Third Edition includes new recipes in every chapter, hundreds of new and updated photographs, and new maps. Patricia A. Heyman worked for years as a pastry chef in restaurant kitchens, for caterers, and as a freelance chef. Later, she taught Culinary Arts at Jefferson Community College, part of the University of Kentucky, where she became a tenured faculty member. During that time, she wrote approximately 25 magazine and newspaper articles on various subjects of cooking and baking. After moving to upstate New York, she taught culinary courses at the State University of New York (SUNY) at Cobleskill, before beginning to write textbooks. Published by Pearson Education, she has written two textbooks, International Cooking: A Culinary Journey (published in 2003) and American Regional Cooking: A Culinary Journey (published in 2009). The second edition of the International Cooking book was published in 2012; this is the third edition.